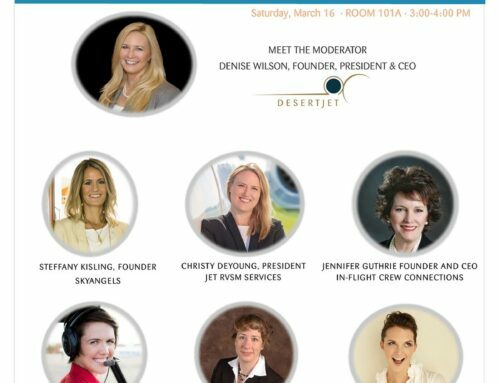 Are Great Aviation Sales Pros Just Born That Way? John and I discuss the book The Charisma Myth by Olivia Fox Cabane – and discover some of the things you can do to become more charismatic, influential, and, of course, more EFFECTIVE as an aviation salesperson. 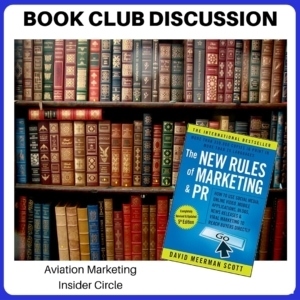 Transcript – Book Club Discussion – Are Great Aviation Sales Pros Born That Way? Paula Williams: Testing one, two, three, four, five, five, four, three, two, one. How we doing? John Williams: Well I don’t know. Paula Williams: Cool. 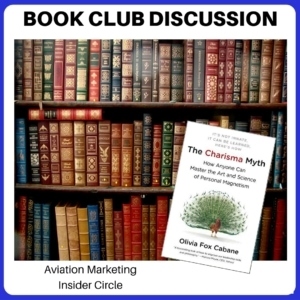 Welcome to this month’s book club discussion, The Charisma Myth by Oliva Fox Cabane. I hope I’m saying that right. I guess I don’t know how she pronounces it, because I’ve only read it, but all right so. 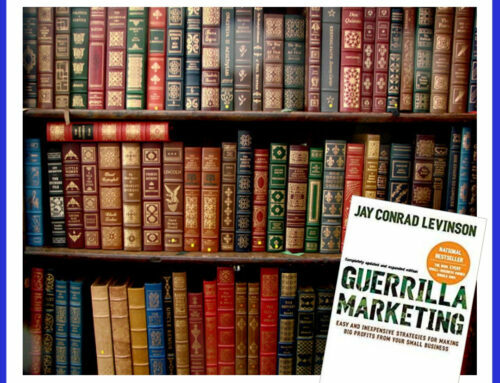 As you know we read one book each month and we like to relate it to our life as aviation sales and marketing consultants, and talk about what was useful, what wasn’t useful, and what works for the aviation industry. So, first impressions, what do you think? John Williams: Rehashed a lot of stuff that I’ve learned the hard way. Paula Williams: [LAUGH] True. But good stuff that you learned the hard way? John Williams: Well, the very first time that I had, in business school, where they recorded everybody doing a BCR or camera audio recording. The first time was nothing to write home about. Paula Williams: Everybody stinks to start with [LAUGH]. John Williams: Well and then a second time something happened for me that I get in front of people again. It happens all the time now and that is it appears to me as though I’m watching myself do this, and as long as that happens everything comes out great. Paula Williams: Right, well, and I think the biggest thing that I found encouraging about this book, especially about the first part of this book, was the whole point that, this isn’t necessarily natural. There are some people who find parts of it more natural than others, but anybody can learn to be more charismatic or to be more effective in their communications, right? John Williams: Yeah, I recall one time when I was put on a jury. It was selection, we were sitting in a jury box, and the attorneys were going at it trying to eliminate people like they always do, and I decided to play a game, having just finished the book on body language. John Williams: So I did the things that I thought were necessary, based on the book, to be, remain open and partial, and blah, blah, blah. Paula Williams: Because you wanted to be on this jury? John Williams: Well, yeah, [LAUGH] beats the heck out of sitting back there, twiddling your thumbs, waiting to call for the next one. Paula Williams: Yeah, I guess that’s true. John Williams: So I did that, was selected. [LAUGH] I did it better than I thought, because, after, we were all selected, then they looked at me and they said, we want you to be the foreman. [LAUGH] I didn’t want to be the foreman. Paula Williams: You did it too well. Paula Williams: All right. Well, I think that’s a pretty good testament to, you can make thing happen through body language and I think all of us learn this to a certain degree through trial and error, but it’s kind of nice to read somebody that’s actually made a study of this at MIT and Harvard and other places, and has obviously shown things that work well enough to have made a it a career out of this, right? “Marilyn Monroe wanted to prove a point. It was a sunny summer day in New York City, 1955. With a magazine editor and photographer in tow Marilyn walked into the Grand Central Terminal. Though it was the middle of a busy work day, and the platform was packed with people, not a single person noticed her as she stood waiting for the subway. As the photographer’s camera clicked, she boarded the train, and rode along quietly in the corner of the car, nobody recognized her. Marilyn wanted to show that just by deciding to, she could either be glamorous Marilyn Monroe or plain Norma Jean Baker. On the subway she was Norma Jean, but when she resurfaced on that busy New York sidewalk she decided to turn into Marilyn. She looked around and teasingly asked her photographer do you want to see her? There were no grand gestures, she just swept up her hair and struck a pose. With a simple shift she suddenly became magnetic, an aura of magic seemed to ripple out of her and everything stopped. Time stood still as did the people around her who blinked in amazement as they suddenly recognized the star in their midst. In an instant Marilyn was engulfed by fans and it took several shoving, scary minutes for the photographer to help her escape the growing crowd. Charisma has always been an intriguing and controversial subject. Paula Williams: So the whole book is basically about different behaviors and very scientific things you can do, or not do, to work in your favorite or not, and not all of us want to be Marilyn Monroe [LAUGH] certainly not all the time. But a lot of these things can be used in different circumstances to get the effect that you want, right? John Williams: I had to digress momentarily in that whole scenario I described in the courtroom. Paula Williams: The jury situation, yeah. John Williams: I didn’t say a word. Nor was I asked a question. Paula Williams: So, completely nonverbal just body language. Paula Williams: The vast majority of folks listening to this podcast are men, so I wanted to give you a reason why this can be useful from a male perspective, right? John Williams: Of course. You want me to read this? Paula Williams: You can read it or I could read it, I don’t care. John Williams: “This pertains to the election of 1886. It was Gladstone versus Disraeli. The purpose of Prime Minister of the United Kingdom. It’s the Victorian era, so whoever won was going to rule half the world. In the very last week before the election, both men happened to take the same young woman out to dinner, separately, of course. Naturally, the press asked her what impressions the rivals made. She said, after dining with Mr. Gladstone, I thought he was the cleverest person in England. Paula Williams: So the difference there, and of course, who won the election? Paula Williams: Disraeli, exactly, and I think in a lot of cases, people who make other people feel smart are Will win just about any argument or will prevail over someone that seems smart themselves. And I think in a lot of cases, salespeople, especially in the aviation industry, want to seem smart themselves. And they don’t necessarily place that distinction on the person that they’re meeting with, or help them come to the right conclusions. They just want to get all of this information out into the room, and they think well the other person will make the right decision. But what you really need to do is make the other person feel competent and comfortable making a decision. And that’s the piece that’s missing I think in a lot of cases for sales and aviation, right? John Williams: Possibly, unfortunately or fortunately I have another quick story. John Williams: Having to do with exactly this. I had done this with both of my youngsters, who are not that young anymore. John Williams: I mean like now one’s a jet pilot flying around the world and the other one is a high up in contracts in DOD. But and I have worked in each of their fields so I know, and they communicate with me. Having to deal with office politics and so on and so forth and we can discuss that. But as it happened, and it happened to my son first. He was talking about all this stuff and having to do with aviation and I paused. John Williams: And I told him, I said I want to tell you something, that is probably a little Asian in tone, but I say the time is right. Said sometimes, when time is right, the master becomes the student and the student becomes the master. You are in the aviation world right now, and you are far more knowledgeable in all the things than I am. So I’m taking your advice, not the other way. Paula Williams: Yeah, he’s flying everyday. John Williams: And it was a long pause. John Williams: [LAUGH] And he said. John Williams: My daughter, who ended up taking the job that I had, and then like within a year or so she far exceeded my capabilities, my everything I have. I didn’t feel like it should have been a job to start with and I know that she was perfect for it, and I was able to hire her. And then she was asking me and I did the same thing to her, I said exactly, sometimes the master becomes the student, and the student becomes the master. I said you’re in this every day, you can bounce stuff off of me, but I have to listen to you as a person that knows. John Williams: And there was another long pause and she said. Paula Williams: [LAUGH] And in both cases it worked, so that’s great. John Williams: Well, it was serious. Paula Williams: Yeah, I know. Absolutely. Right, so the cool thing about this is, that there are really three elements to charisma in Caban’s view. And I think this makes sense, or at least I agree with the premise. That there are three elements that you can control. And those are presence, authority, and warmth. Presence meaning I am here in the room. I am not distracted by some other thing. I’m really paying attention in this conversation. Authority meaning I have the knowledge and the skills that you should listen to me. And then warmth meaning I do care about your situation and I really want to help you. So, if you have those three things, you’re going to be a whole a lot more influential than if one of those, one or more of those, is missing, right? Paula Williams: Yeah, so, it’s not magic, it’s learned behaviors. And I’ve always thought that there were people that I looked up to that I thought had this gift, and were very charismatic and were great speakers. And one of them was Stephen Covey, I used to work for Franklin Covey and Stephen Covey, whenever he would speak, he would learn and remember, he’d stand at the doorway as people were filing in and he’d have an auditorium full of people and he would have shaken pretty much everybody’s hand as they walk in. And he would remember hundreds of names. And he’d be up on stage talking and he would bring people into the conversation, by name, people that he’d never met before. And he used all three of those things, of course he had a lot of presence, was very focused on the conversation, very focused on the subject matter of what he’s talking about. So he kind of forgot himself, he would focus on the people he’s speaking to and the subject that he’s talking about. And then authority of course he’s Stephen Covey for Pete’s sake [LAUGH] No, no problem there, and then warmth. He would use those names, he would use a very specific trick, I guess, if you want to call it a trick. It’s something that he taught other people to do. I never got quite as good as he was at it. [LAUGH] But it was a technique that actually conveyed warmth. He took the trouble to do it and it was really, really effective. It was amazing to see him speak. It was very difficult, even if you knew all of the tricks he was using, not to be very impressed by them, right? John Williams: Or affected by it, anyway. Paula Williams: Yeah, absolutely, all right, so next thing, overcoming obstacles, there’s always obstacles right? Paula Williams: In a perfect world everybody could do this perfectly every time, right? John Williams: I don’t know that that’s true, even in a perfect world. Paula Williams: Mm-hm, true, but this is what makes it fun. Paula Williams: Is that every situation you go into, there are going to be problems. 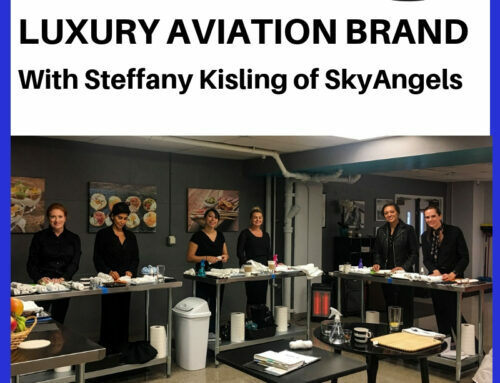 And one of the ones that I think is kind of interesting in the aviation industry is the showing up to a meeting or a discussion, half of the world as far as technology and high tech fields and other kinds of things are kind of going towards a business casual. Aviation is staying more in a formal dress code and things like that. So if you show up to a meeting feeling out of place either one direction or the other you feel kinda weird. And it’s kinda hard to have that authority, presence, and warmth if you are way underdressed or way overdressed right? John Williams: True, particularly if you’re underdressed. John Williams: Yeah, you just can’t do it. Paula Williams: [LAUGH] Right? If you’re in a T-shirt and jeans. Although there are people who can, I’ve seen it done. Paula Williams: Right, but you’re starting with one strike against you. So I think kind of the, what you need to do is just make up for the missing ingredients. If you’re overdressed, you can always put more warmth into the conversation, be more human. If you are underdressed, it’s a little harder to make up that authority gap, right. Paula Williams: So yeah, once again, authority, presence, and warmth. And you don’t want to seem unprepared, which sometimes can happen if you’re underdressed. You don’t seem present because you didn’t prepare for this meeting or you didn’t ask what’s the dress code, or anything else. So the real way to avoid all that is to say, just ask, before the meeting, how’s everybody dressing for this? John Williams: And which happen, To me at NBAA a while back because we had to get all the electronics set up. John Williams: So I was dressed for the presentation and the guys I had to work with were technicians. John Williams: And that was very interesting and very fun. And I just let them take the lead, but then when they saw the equipment I had and I explained to them how it worked and so forth, and they were right there. And they said, you know it’s not, and in fact they told me, it’s nice to see somebody come here prepared. Paula Williams: If you don’t start out feeling uncomfortable right, okay. The other thing that happens a lot in the sales presentations that we coach, or that we see, or that people perform with us is that they tend to bury us in data or bury the prospect in data. John Williams: Or try to. Paula Williams: Right, exactly, and it is really hard to have the presence, the warmth, and the authority if people don’t have a clue what you’re talking about. And there are so many times when we see you’re losing people in the first 5 minutes and if you don’t step in and go, wait just a minute, let’s back up and talk about why this is important. And not just flood people with charts and graphs and data and facts and features and so on. And this kinda goes toward the feature versus benefit scenario, a benefit is always why is this important to the prospect? Not, we have these really fantastic gee wiz gizmos that are 1000 times better than anybody else’s, with no idea why or what that means in the real life of the prospect, right? Paula Williams: Right, so that’s another obstacle that I think a lot of people have. And that is that they overcomplicate their sales presentations. And they really need to simplify so that they can focus more on the importance of presence, authority, and warmth. Because if you don’t have those things, it doesn’t matter what data you put out there. People aren’t going to believe it anyway right? John Williams: Yep, just like any project. John Williams: You have to know what altitude you’re talking to. Paula Williams: Right I think there’s a really good story that I heard in a mastermind group for marketing and this was basically given by a doctor. And he was in shorts and a t-shirt in a grocery store. And this guy happens to be an ENT, ear nose and throat specialist. He’s got more degrees than you could shake a stick at. He’s got these unbelievably qualifications. And it costs, if you went to go see him, thousands and thousands of dollars or hundreds of thousands of dollars to go see this guy. But anyway he sees this woman and her child in a grocery store, and the child is coughing, and he’s just like I should go up to her and just tell her to do this and that and the other thing, something really simple. I don’t even remember what it was, if it was vapor or eucalyptus or something. But anyway, something really simple. And then he thought, you know what? She is not going to receive that very well, because I’m in a grocery store. She has no reason to believe me, I’m in shorts and a T-shirt. And she’s going to think I’m some kind of a crackpot that has no authority, presence, or warmth, I’m just some dude on the street. But if she came to see me in my office, I would give her exactly the same advice where I’m in my lab coat, I’ve got that authority, she’s waited for half an hour and she’s paid $100,000 to see me. And then I would tell her exactly the same thing, and she would follow it religiously and she’d get great results. So it is worth setting up these elements of charisma, in order to be believed. Otherwise you’re just working against yourself, and it doesn’t matter how qualified you are, if you don’t set up these elements, nobody is going to believe you, right? Paula Williams: Okay, cool, all right, carrying on, charismatic first impressions. Paula Williams: One thing that I really like is, in the first 15 seconds people decide are you friend, foe, or food [LAUGH]. John Williams: I don’t know about the food part. Paula Williams: Right well I mean it’s almost a biological thing and if you’ve ever been diving, scuba diving. Paula Williams: But you can just tell, from the look on the shark’s face, that he’s going through this evaluation of, how much hassle is this person going to be to eat? And hopefully they make the decision, you know what, I’m going to go after something less dressed up [LAUGH]. Paula Williams: Or less complicated, right? Paula Williams: On the other hand, if you meet a dolphin, their first impression is, how much fun is this person going to be, right? John Williams: Yep and if you’ve ever swam with dolphins. Paula Williams: Mm-hm and it’s like what games can we play? What can we do together? What’s going to be fun about this experience? And it’s obvious from their demeanor and their facial expression and everything else. So this stuff goes beyond human, [LAUGH] it’s biological. When you first meet something you have a first impression, right? Okay, so people instantly judge a lot of different things within less than a second. And there’s some notes that I took from the book if you want to share those or I will share those. All right, so why do first impressions last so long? Because according to economist Kenneth Galbraith, when faced with a choice between changing one’s mind and proving that there is no need to do so, almost everyone gets busy on the proof that there is no need to do so. The truth of first impressions, even based on a photograph, people are almost always right about their first impressions, even if they’ve just seen a photograph of a person. Which I think is kinda crazy, but it seems absolutely true. And CEOs admit that they make a decision in the first few seconds of an interview, so it doesn’t really matter what people say or what people do, the decision’s already been made in the first few seconds. And I think it’s really interesting that people are almost always right. Paula Williams: I guess that comes from, what was it, Malcolm Gladwell’s book Blink. People process more information than they’re conscious of processing. So when you meet somebody, you have a pretty good idea of whether they’re nervous or not, what their authority level is, all of those different things. 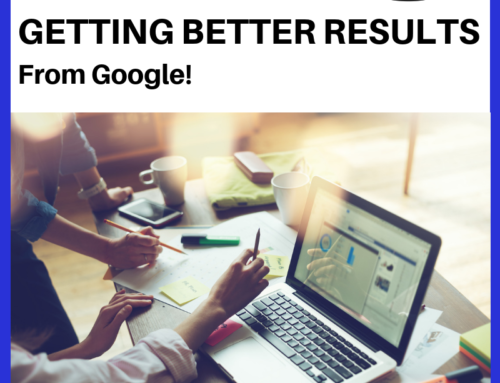 Without even consciously thinking about it, you’re processing a ton of data. Paula Williams: Level of these groups and the Diamond Lounge basically is where people hang out between lectures and we have like half an hour between lectures this one day. And Parthiv Shah, never met him before, first impression, he walks up to Jon and I at this little cocktail table. We’re eating munchies and getting ready for the next half hour of Or next several hours of lectures. And we’re pretty much exhausted from a bunch of things, traveling, and everything else, and so forth, and so on. Parthiv was just bubbling with enthusiasm. 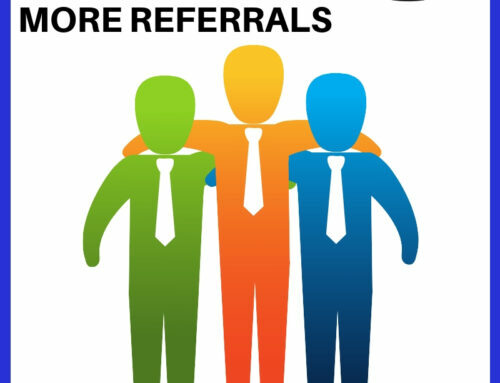 And he comes up to us and says, hi, I’m Parthiv Shah, and this is my company, and I want to hear everything about what you do because we’re going to make a lot of money together. I’m, [LAUGH] that’s interesting. And he just laid out, here’s what I do, listen very carefully, here’s what we do, and was just all brainstorming for the next half hour. And we were late for our next set of lectures because he was so engaging and so involved. Paula Williams: And effervescent, [LAUGH] and we have not yet figured out how to make a million dollars together. But, that’s still in the works. John Williams: Not for lack of trying. Paula Williams: Not for lack of trying. And obviously, he’s very successful at what he does because I’m sure this is not the first time that he’s done this. And he’s so genuine, and so honest, and so earnest in his approach to, you’re here, you’re obviously very talented, you’re doing something, and everything else, and so forth, and so on. John Williams: And he does, he was talking just about like that. Paula Williams: And has this overwhelming charisma and presence that you can’t help, but smile, and be affected by it. Paula Williams: And Parthiv, if you’re listening to this, we’re still working on that. So, we will figure out something to make a million dollars together, and it will be mutually very profitable. But, all right, so, let’s talk about speaking and listening with charisma. That, of course, is one of the keys to this after you’ve made a first impression, right? I really like this quote. I’m not sure if she was the first person that said it, Margaret Ruvoldt. Argue like you’re right, and listen like you’re wrong. I think most of us fall down on the second one more often than the first, at least, I do. But, we also need to have the strength of our convictions. But be willing to set those aside when it’s the other person’s turn to speak, right? Not easy to do. Paula Williams: Okay, interruptions is one thing that she spends a lot of time in the book, and for good reason, I think. And her advice is don’t do it, no matter how warm or congratulatory your input, it always results in a twinge of resentment. There’s always a cost to an interruption. John Williams: And I disagree. Paula Williams: Okay, of course, you do. Paula Williams: I’m listening like I’m wrong. John Williams: Well, I mean, there are many times in at least technical discussions when somebody, you can save 15 or 20 minutes of time if you zap them at a certain point and say, hold it. And ask them a quick question to make sure they made the right assumptions for where they’re going, if they have it, and let’s say, thanks. And then it go in a different way. So interruptions are not always bad. In fact, I can remember having a meeting in Europe, [LAUGH] with a whole bunch of people which involves some native Indians from India. And I was going down to this, and they were all nodding their heads. And nobody interrupted me, and we got to the end. And they were kind of talking to me I said, but you agreed with me. And they said, no, we didn’t agree with you. But you were shaking your head. No, no, no. Paula Williams: So that you wish they would have interrupted you? Paula Williams: Wow, okay, well, in that case, I stand somewhat corrected. Paula Williams: All though, I do think in most cases, she’s right. Being interrupted does cause people to first, their first impression at being interrupted is how dare you. And their second is, okay, maybe, you have a point. Paula Williams: You’re starting out on the wrong foot potentially. John Williams: I think the problem is that there are instances, and she doesn’t describe what those instances are when you shouldn’t. And because of her predilection, I’ll say. John Williams: Predisposition, she doesn’t want to even talk about the fact that there are times when you should. Paula Williams: Okay, I will concede that, but I think that for the most part she’s probably right more often than not. John Williams: I disagree with that too. John Williams: Again, depends on the situation. Paula Williams: Totally agree with that. Okay, so, on the other hand, when you’re in a sales presentation and someone interrupts you, you can turn that on it’s head and just say, okay, congratulations. [LAUGH] You have struck a chord, or you have upset somebody, or you have done something to cause a response. And their response is always good, whether the response is good or bad, it is good in your favor if you’re the salesperson because then you know more than you did before. So, if you take the good and ignore the bad, you can use that in your presentation. John Williams: In a sales situation, when a sales guy says something and the client is responding then, yeah, you don’t want to interrupt that. On the other hand, the person listening to the sales presentation has every right and should interrupt time to time. Paula Williams: Cool, all right, so, difficult situations. [LAUGH] We both had these, and I actually really like her advice on this. I have actually used this without knowing that that was what we were doing. John Williams: Yes, you have. Paula Williams: In one instance, working at a very large organization that shall be unnamed. There was a situation where there was something where I felt very strongly that I was right, and there was a group of people that felt very strongly the other way. It was actually a committee, right? So going before this committee was a huge waste of my time and theirs. Paula Williams: And I got my way. So, if you hit an impasse with a group of people, meeting with and convincing each person, [COUGH] one at a time, will do a number of things in your favor. One is, it breaks up the group think. It breaks up the solidarity of the group, they don’t feel like they have to be loyal to one another. And secondly, it allows you to adapt your presentation to help them rationalize in your favor, right? John Williams: Well, I recall another time when you were able to convince the board of directors of a very large firm in a different state of the things you were talking about. John Williams: No, they were all in the room. John Williams: But, again, you didn’t have to do this, but you did all the rest of these things. Paula Williams: Yep that worked that time. We didn’t have the luxury of dividing and conquering, we had to get it done in a hour. John Williams: It’s all right. Paula Williams: So yeah. Another thing is to express appreciation even for small things. So you can agree on the smallest thing and express appreciation for, okay, you’re very smart [LAUGH]. I’m glad you see this. I think that really sets a warmer tone, and helps you get through some of the difficulties of a situation, even if you can agree on the smallest thing. Where to sit or whatever. There’s always something, some general principle that you can agree on. The disagreement is usually smaller than you expect it to be, it’s a matter of putting a fence around. Here’s what we agree on, here’s what we disagree on. We agree on method but we disagree on means or vice versa, and so on. And the other thing is to protect yourself, and I think this is a really good one. There was a situation I read about in the news that a certain. Paula Williams: Personality his attorneys meet with him in twos. And the reason is because he does have a tendency to either forget or be dishonest about situations is the future. So, by having two people there you can either record the situation, or at least have witnesses that this is what happened. So, if you protect yourself, you feel a whole lot more comfortable in the situation, and then you have a lot more freedom to act with authority, presence, and warmth. Because you’re not concerned that you’re getting railroaded or sidelined or any horrible thing is in the process of happening to you because you have taken the precautions to protect yourself, right? Paula Williams: Anything to add to any of those? Paula Williams: Nope? Okay, carrying on. Presenting with Charisma. I think the way that she outlined presentations was an awful lot like a book that we used earlier in the year, Joey Asher’s Even A Geek Can Speak. And the structure that she outlined I think Joey Asher kind of did a better job, and of course the whole book in that case was built on setting out the structure. And in Cabane’s book, she really only devoted about a page or two to it. So, I think Joey did a better job, but basically you start with a story, you do your three main points, and you do a conclusion. And it’s really hard to improve on that structure. And if you add in all of the things that we learned about warmth, presence, and authority to a structure like this it’s really hard to go wrong, right? Paula Williams: Absolutely. So, a lot of people go into all of these tips, and tricks, and nifty doodads, and gadgets, and AV, and fireworks, and spectacles, and everything else. But, if you look at like TED presentations, the ones that do really, really well and have a hundreds of views or hundreds of thousands of views, are the ones that do this. Very simply start with a very compelling story, give three main points, and a conclusion and don’t try to do too much. And I think that really is the point where a lot of aviation sales people especially go wrong as they try to do more than they can in an hour. Or 30 minutes or five minutes or whatever it is that you have with this customer. Paula Williams: So, this works for a phone call, this works for a half hour presentation. This works for a four hour consultation, if you can boil it down into a large version of this same structure, it works really well. Paula Williams: Cool, all right so next month, the New Rules of Marketing and PR, this is David Meerman Scott. This was one of my favorite books probably ten years ago when it first came out. This is actually the fourth edition, he’s updated it four times. And it is probably twice the size that it was the first time I read it. [LAUGH] So, I’m really looking forward to see what’s changed in the last 10 years or so. But this is probably one of the first books that I read when I was getting out of working with Wells Fargo and getting into working with aviation. And kind of jumping out of the corporate structure into being an entrepreneur. So, I think this is a field It will be really interesting to see what’s changed and what’s different. John Williams: Than the last one. Paula Williams: It is jeez, where do you grab one. John Williams: That one, okay. Paula Williams: Yeah this thing is a brick. This is 400 and, we’re counting all the annotations, and indexes and everything else is 457 pages. So this is daunting and some light summer reading for you. But, anyway I do think it is a very worth while read, and this was my bible probably for the first six months after starting our consulting firm. This really did a lot for us so I’m hoping that it will be a really good resource for the group too. Paula Williams: All right, so go sell more stuff. Paula Williams: Absolutely. Have a great month and we will see you next time for our review of new rules of marketing and PR. John Williams: And that quote was from Zig Ziglar. Have a great day, ciao. ..